We selected our tow vehicle in large part for the ease with which it can be “flat towed,” i.e., all wheels on the ground. Most vehicles with automatic transmissions can’t do this since even if you place them in neutral, the transmission is not get lubricated during the tow process. The main exceptions are 4×4 vehicles with transfer cases, like our Loki. Having driven the tracker all the way from Florida, and finally being in possession of The Big Kahuna after two months away we set to the task of acquiring the remaining tow parts and getting them installed. 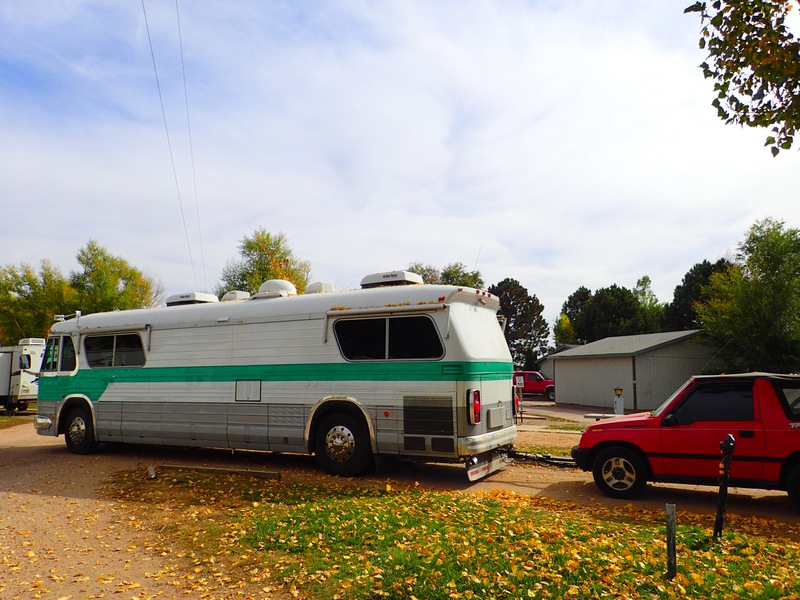 We ordered the base plate that gets bolted to the tow vehicle, had it shipped to Kirby’s Hitch & Wiring in Loveland, where they installed it, rigged the vehicle for brake and turn signal lights, and manufactured the electrical pigtail that connects the bus to Loki. We also scrambled around town trying to find the proper safety tow chains that serve as a back up connection in case the main tow rig comes loose on the road. “Drag test” from our hard packed dirt spot in Greeley. Make sure the wheels roll properly. Once all this was done a helpful neighbor in the Greeley RV park guided me through the connection process, and we were ready for a light and road test. We found two problems: the turn signal lights were wired backwards, and Loki’s back wheels dragged despite my having set him up to roll. 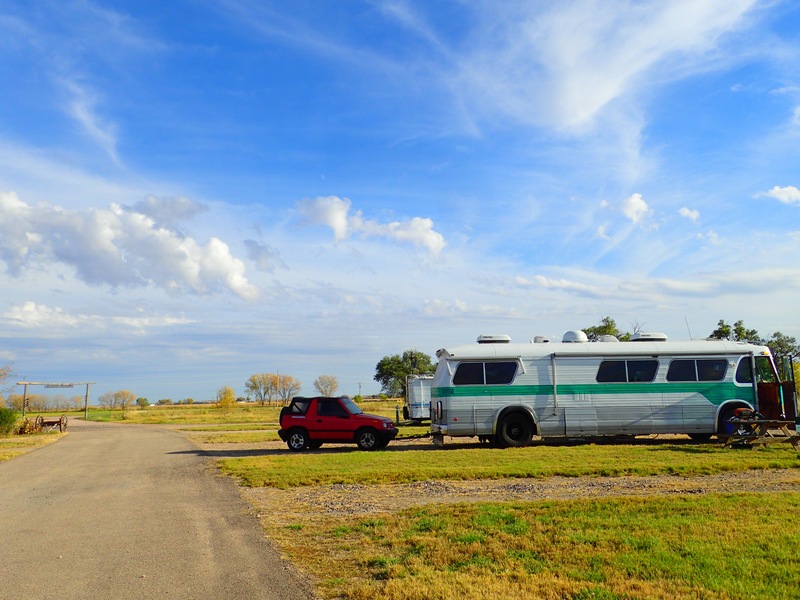 We solved the first problem with a drive back to Kirby’s to have them switch the wiring, and the second with an urgent request for help on the RV.Net forums. The auto trans 4×4 trackers from the 1990’s can be rigged for tow by putting the transfer case shifter in neutral, the automatic transmission in park (! ), the manual lock out hubs in free, and the key in the ignition and turned to the ACC position (so the steering turn lock does not engage). Based on my description, the experts on the forum suspected I did not have the transfer case shifter in true neutral. They were correct: I had assumed that if the shifter knob could be moved freely from side to side it was in neutral, when in fact it was still in “4 High.” I needed to move it forward one more notch to get to neutral. Once I did that we did another short pull to confirm everything rolled freely, then did a couple of miles of road test before we were comfortable taking it on a 175 mile tow into Nebraska. Everything went great. I notice the extra weight a bit going up hills and with what appears to be a bit less acceleration on flats, but we had no actual problems. 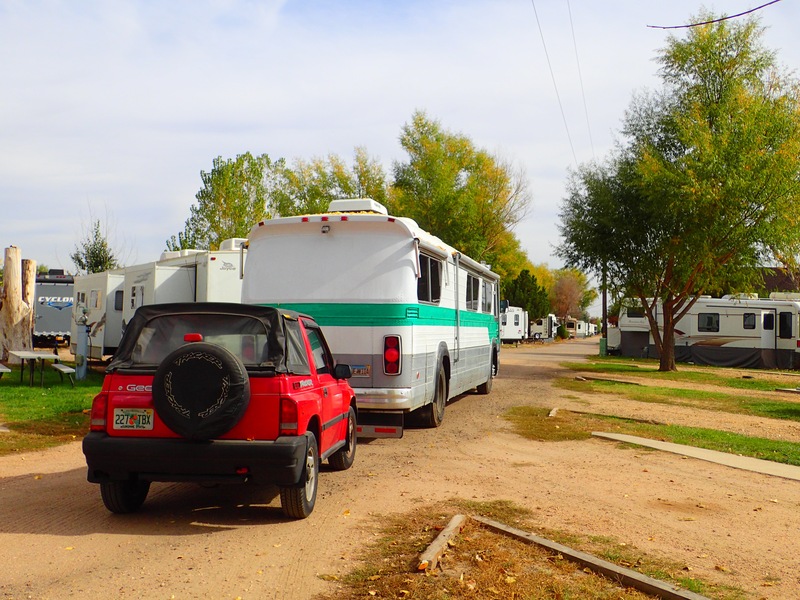 We arrived at the Chimney Rock Pioneer Crossing RV park in the mid afternoon, and have settled in for a two day stay before continuing east. We are looking forward to stops in Iowa, Missouri, Kansas, Oklahoma, Arkansas, Tennessee, and Kentucky before getting to Wilmington, NC to spend Thanksgiving with family. Glad to see you are back on the road. A couple of suggestions for you and your TOAD. First make it a habit to regularly inspect the welds on the tow bar and the connecting points. My dad lost his TOAD over a cliff when the welds failed, luckly no one was hurt. Next, for the sake of convinence, a good locksmith can pin back or remove the bolt from the steering column lock so you don’t have to leave the key in the ignition while towing. It is real easy to stop for lunch along the way and for get to recover the key and have no TOAD when you return. Excellent suggestions. I will look into the locksmith when we get to a stopping point during our trip east.